US, 1985, 85 minutes, Colour. John Candy, Meg Ryan, Eugene Levy, Robert Loggia, Jonathan Banks, Kenneth Mc Millan, Steve Railsback, Brion James, Don Stroud. 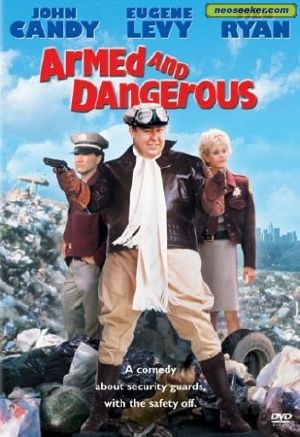 Armed and Dangerous is a slight but amusing comedy-drama, a vehicle for John Candy. He is supported by comedian Eugene Levy. (The appeared together in Speed Zone.) There is a very good supporting cast led by Robert Loggia, Kenneth Mc Millan and Meg Ryan. It is an old story of an ex-policeman and an ex-lawyer employed as security guards who foil criminal activities - by mistake as well as by intention. There are some car chases, some smash-ups - with Steve Railsback as the cowboy driver of a petrol wagon. The film was directed by Mark Lester, veteran of such tough action films as Truck Stop Women, Bobby Jo and the Outlaw and The Class of 84. 1. Enjoyable comedy-drama? Crime caper? Criminals, police? 2. Los Angeles settings, the world of the police, of armed guards, warehouses? Stunts and action? Musical score? 3. The title and its humorous reference to Frank and Norman? 4. Frank and his work as a policeman, framed with the television set, suspended? His going to be an armed guard, the meeting with Norman, the class, the insurance and the union? Working with Norm, their being set up? The robbery? Going to Maggie and enlisting her help? The confrontation with O' Connell? Carlino and his henchmen? Their going to the party, in the sauna and hearing the truth? The pursuit, the murder? The chase, the cowboy with the petrol? Confrontations, explosions? Their going back into the force? Frank as a genial character? Norm and his background in the law, the failure of his eccentric case and the mad client? His questions at the lesson? Not wanting to be a lawyer? Sharing the adventures with Frank? The attraction to Maggie? 5. O' Connell, his work, the armed guards? His link with Carlino? Maggie confronting him? The truth and his helping the police? 6. The picture of Carlino, the racketeers, his henchmen? The police in his pay - and their framing Frank? The violence, the chase? The arrest? 7. The picture of corrupt police? The armed guards - and the cross-eyed black guard and his being interrogated by Frank and Norm at the gym? 8. Familiar material, the picture of the police, crime in the American cities, mobsters? The heroes and their victory?